It's been 31 years since we've visited Zamunda, and it's about time we went back! 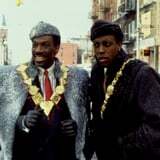 The long-awaited sequel to the 1988 romantic comedy Coming to America has officially become a reality. Paramount Pictures has tapped Craig Brewer, the director of Hustle & Flow and the Footloose remake, to lead the project. Brewer is fresh from having directed Eddie Murphy in the Netflix film Dolemite Is My Name, and according to Deadline, the two are eager to work together again.